Our opening hours are Mon-Fri: 8am-9pm, Sat-Sun: 9am-8pm. Iberia has introduced the A330 and new A340-600 aircraft for some of its long-haul services. Featuring a spacious design, the new and improved Economy cabin is fitted with 46cm-wide seats with adjustable headrests, in-seat power supply and, for the first time in Iberia Economy, nine-inch personal touch-screen TVs. Each seat also features an individual reading light and a magazine rack in the seatback, for storing personal items. On-board Wi-Fi is also available at a cost. Short-haul and mid-haul journeys, and those on non-upgraded long-haul aircrafts, offer spacious seats and rows, scheduled movie experiences and a satellite phone on intercontinental flights. 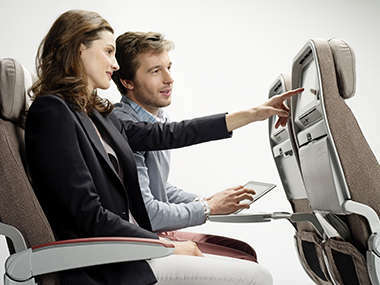 Entertainment: Enjoy more than 50 films in different languages on Iberia’s seatback screens. Featuring comedy, drama, cartoons, action and suspense, as well as music and games, passengers will have access to hours of personal, on-demand programming in English, Italian, French, Portuguese or Spanish. 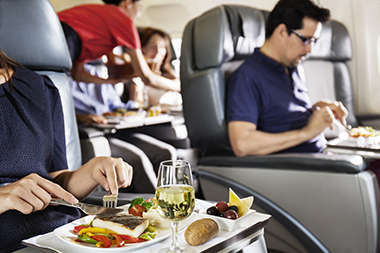 Food and Beverage: Complimentary meals are provided for flights lasting over four-and-a-half hours and you will either get breakfast, lunch or dinner depending on the time of boarding. Passengers will have two different meal options to choose from, influenced by healthy and seasonal produce. For short flights, an in-flight pay service with a new menu is available. Business Class is available on short-haul flights and offers an attentive service and greater personal space, with a free seat next to you guaranteed. The seats have more legroom than Economy flights and recline three times as much too, going back six inches. Business Class passengers are also treated to complimentary meals during the flight and will get preferential treatment at check-in, boarding and disembarkation. Food and Beverage: One meal is included in the Business Class cabin, from a fortifying breakfast to a delicious dinner depending on when you fly. For additional light snacks or meals, the in-flight pay service offers a new flavour-packed menu. 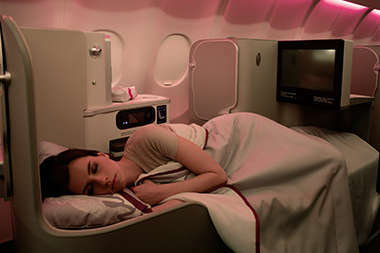 Business Club perks on medium-haul flights include spacious seating that reclines 30cm (six times that of Economy), as well as having a four-position adjustable headrest. There’s also an extendable leg and footrest, a cocktail table, individual coat hanger and a wine rack. The perks however begin from the time you arrive at the airport. Where possible you’ll be fast-tracked through security, receive priority check-in, boarding and disembarkation, and have the chance to relax in the VIP lounge before you fly. Entertainment: All Business Club passengers will have access to a PSP on all flights, except those going to Lagos, where iPads will be available. Food and Beverage: As with Business Class, Business Club meals are included. As Business Club is for mid-haul flights, this will include two items, either a hot breakfast and cold snack, a cold snack and hot lunch, or a hot dinner and cold breakfast. For additional light snacks or meals, there is an in-flight pay service. Undoubtedly the most relaxed way to fly, Iberia’s Business Plus is available on all long-haul flights. It offers the finest in food, entertainment and comfort. Its large, private seating areas offer individual seats, adjustable headrests, adjustable back pillows with massage function and – most importantly – seats that fully recline to become a flat bed. Combine all this with fine dining and a dedicated service, both on the ground and in the air, and you won’t want to leave the plane. Entertainment: On long-haul and upgraded long-haul aircrafts, on-demand entertainment is available throughout the flight on personal TV screens that are 10.4 inches and 15.4 inches respectively. Noise-cancelling headphones are also available for maximum listening enjoyment. On upgraded aircrafts USB and power ports can charge up laptops, tablets and other electronic devices, and a 4.2-inch remote controls your personal TV. Food and Beverage: Promising an eight-star dining experience, the new long-haul food offering has been designed by four internationally-renowned Spanish chefs – each with two Michelin stars to their name. Your palate will be rewarded by an exclusive combination of heady flavours and authentic textures, paired with wines and cavas from Spain’s finest vineyards. Each Economy or Business Class passenger is entitled to one carry-on bag with a size restriction of 56cm x 45cm x 25cm. Business Plus passengers can take two such bags. For easy access, place commonly used in-flight items in a smaller bag underneath the seat in front of you. Iberia Plus ORO and Iberia Plus Platino members receive additional checked luggage. See website for more details. Baggage allowances may differ on other airlines. Check beforehand if your itinerary includes travel on an alliance partner airline. Many bulky items such as sporting equipment and musical instruments can be checked in as part of the passengers free baggage allowance. Musical instruments that fit within the carry-on size dimensions can be taken in the cabin. Your Flight Centre Travel Expert can help determine what items are permitted and what items will incur an additional charge. Non-motorised bicycles are permitted only if packed in a protective case or bag. Pedals should be removed and tyres deflated. An extra carry-on bag is permitted for children but must fit within the specified dimensions. For children and infants, car seats and collapsible pushchairs can also be checked in free of charge. Infants are considered under the age of two and pay 10% of standard airfare. Children aged two and older must have a seat purchased for them. There are many liquids and materials that are banned from flying. Consult with your Flight Centre Airfare Expert on specific items that are banned. Flammable liquids, gases and materials such as matches are not allowed. Explosives, fireworks, poisons, fertilisers are also banned substances. Equipment with petrol engines is sometimes allowed to fly if drained of fuel before hand. Always check with your Flight Centre consultant before departure on what is allowed on board. There are various ways to check in for your flight with Iberia. Iberia lists 13 VIP rooms in airports around the world. 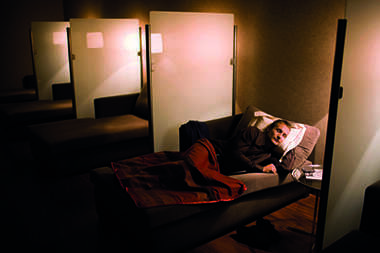 Lounge access is available to those flying in Business Plus or Business Class, as well as customers who are members of the Platinum and Gold Iberia Plus programme. OneWorld alliance members with Emerald and Sapphire status, as well as a valid boarding pass for the day, may also use the lounges. From London Heathrow, Iberia customers can use British Airways' Galleries lounges in Terminal 5, which offer free Wi-Fi, a self-service bar, TVs and PCs. Lounges offer the chance to escape the hustle and bustle of the terminal, relax and get your strength back with a drink or some fine dining before your flight. Some lounges even boast shower facilities, relaxation rooms and exclusive restaurants. Iberia is a member of the oneworld Alliance and frequent flyer points can be earned and redeemed on these partner carriers. Oneworld members include British Airways, Qantas, American Airlines, Cathay Pacific, JAL, Malaysia Airways, Finnair, LAN and others. Iberia Plus is Iberia's own frequent flyer program, which accumulates Avios points to be used towards flights and other services. Status levels include Classic, Silver, Gold or Platinum.